Home Latest A top giveaway to round off 2018! A top giveaway to round off 2018! – Some chocolates for the sweeter moments in life! At home with family (and cat!). Lovely relaxed Christmas. At home with family in Leicestershire. I will be at home in Vancouver, Canada, for the holidays. In leafy Surrey with brother and sister-in-law and family. Wendy J’s name came out of the hat! I’ll be at home cosy in the beautiful Yorkshire Wolds, thinking about what books to take with me to Australia. I will be spending it at home – sleeping on the living room floor so that everyone else can have a bed! Christmas will be spent at home with my partner, probably binging on chocolate and Netflix! For the first time since my son was born five years ago, we’ll be spending Christmas at home. Family are descending on us this time and we’re all getting giddy with excitement! Sounds like a lot of fun, and such great family time. Enjoy!!! I will be spending the festive season at home but Christmas day will be spent at my mum and dads and I will use the holiday period to visit the rest of my family and friends. I will be spending the holidays with my husband, two sons, daughter-in-law and mother-in-law at our home on the Canadian Prairies. Can’t wait! At home, with my boys all home too. And then to the Isle of Wight to visit the rest of our lovely family. My wife and I will be at home in the morning then at my mum’s house for dinner and presents. I’ll be at home with my daughter who has been away working on her masters degree. Then we will have dinner at my neighbor’s house. Dividing my time between home in Surrey and West Sussex with family. I hope I win, the book looks good, and the tea towel would come in very handy for the washing up on Christmas day! The tea towel also doubles up as a good bus guide!!! Enjoy your Christmas! That sounds lovely, cosy and quiet. Enjoy! At home with family as usual, enjoying traditional Turkey dinner with all the trimmings. Sounds warm and cosy. Have a lovely Christmas!!! I will be spending it at home in our nice quiet little village. Sounds lovely and cosy!!! Enjoy! Lovely NY Christmas, sounds wonderful! Looking forward to Christmas Day when our younger daughter & her husband open their home to three generations of three families & neighbours. It’s quite a party with everyone mucking in with the cooking & chores, good food & drink, fun & games! Sounds like what Christmas should be about. Enjoy! At home in Oxfordshire, but we are off to Riga next week to get into the Christmas spirit. Plenty of Christmas markets to get you in the mood!!! Enjoy! I will be spending time with my family for the holidays. Thanks for the chance. Sound lovely and cosy!!! Enjoy! At home in Michigan with family and friends. Hello over in Michigan. Have a lovely Christmas!!! In Florida with friends as working on boxing day but wishing I was in England with family enjoying turkey, christmas cake and christmas pudding. Aw, Florida will be nice too! Enjoy!! At home, in Kuala Lumpur, Malaysia, with my family. Lovely to hear from you. Enjoy KL!!! At home with my family – I prefer being at home – couldn’t bear to pack up and go away somewhere. It sounds like it’s going to be a lovely, cosy Christmas! With family and friends at home in Norfolk with plenty of blustery dog walking on the beach! By the sea… have a lovely Christmas! I will spending Christmas with my parents in Singapore. Relaxing by the pool reading a book. Well, that sounds just lovely! Enjoy! So very different to Europe! Have a lovely time!!! Oh bless, mums are always best. Have a good enough Christmas! At home with family this year. And someone else cooking a lovely lunch hopefully! Hope you find your new home very soon!!! We will be spending Christmas at home as usual. My husband will be cooking Christmas dinner for 8 plus our little grandson! Yay, that sounds fabulous!!! Enjoy! The best place – snuggled up in my reading room at home! Mum cooking with an audiobook on her iPod in the kitchen whilst I am reading upstairs and Dad watches a videoed rugby match in the lounge.. in fact the same as pretty much everyday but somehow everything just feels rosier..! Beautiful part of the world. Have a good time! At home with my family on Christmas Day then visiting extended family on Boxing Day. 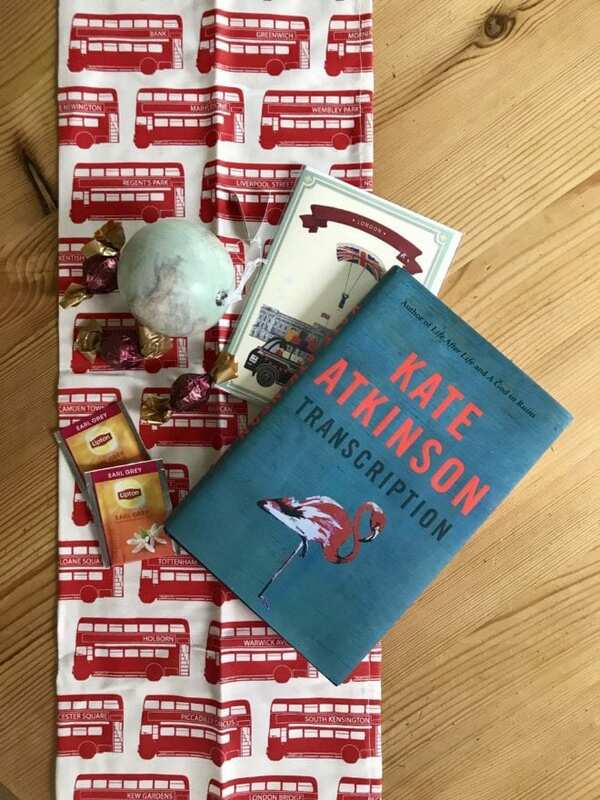 Great prize, I love Kate Atkinson, in fact I can’t believe I haven’t read this one yet! Sounds all well planned. Have a lovely time! Very different and lovely. Enjoy! At home, looking forward to family returning for a couple of days. It’s lovely being with family over Christmas. Enjoy! Counting down the day, I bet! Enjoy! Oooh, sounds ace. Have a fab Christmas! We’re spending Christmas Day with our daughter and son in law. Hopefully she had a great teacher when it comes cooking to Christmas dinner! Ace, sounds like it might just be an excellent dinner awaiting you! Enjoy! If that is all you argue about… then it will be a fab Christmas. Enjoy! At home but it will be a far quieter Christmas than years before. Quiet is good, for sure. Have a lovely time!!! I will spend Christmas itself in deepest Kent with extended family & Boxing Day I will be with friends in ….London!! Sounds wonderfully varied, have a lovely time!!! My husband died on the 29th of September 20q8 so as all my family are in New Zealand and Australia it’s just me and two cats at home in the North West of England this year. Feet up – Reading a good book !! I wonder what title you will choose!!! Have a good time! In my new home – hopefully reading Transcription !!! Oh, enjoy your new home. Who knows what book you will be reading!! Have a good time! Spending it with my family at home. Oh, yes, that is hard when it is likely to be the last Christmas that you can both enjoy at some level.. take lots of care!!! My children and their families and my parents will be coming to my house to celebrate Christmas a few days before Christmas Day. My husband and I will most likely celebrate Christmas Day by ourselves at home. This way at least you get some family time. Enjoy it all in its various forms! Whoah, what fun and games and SO different. Have a lovely time!!! I will be spending Christmas with family at home in Worthing, West Sussex. Enjoy your time, a beautiful part of the world! At home in Pennsylvania! Hoping we have a white Christmas!! Greetings across the pond, hope you have a lovely time!!! I will be at home with my family, the best place to be at Christmas! I Will be going to see my mother in law in Berlin. Enjoy… and raise a glass of Glühwein!!! I will be spending Christmas at home in Surrey with my family including my two young grand-daughters & my baby grandson. Lovely to have small children around at Christmas. Enjoy!!! Ooh Christmas by the seaside. Have a lovely time!!! Sounds like lots of variety and a good combination. Enjoy!!! Christmas at home. The day will be hubby, daughter and grandbaby. Then a few days later Son and daughter in law will come up from Tampa!!! Such a lovely part of the world. Enjoy!!! I will be spending this Christmas with my son and his new Irish wife in Ireland with her family. Can’t wait! Lovely to have tiny children around at Christmas. Enjoy!!! Christmas with all my Family can’t wait! Enjoy your time with family!!! Spending Christmas at home with family. As usual at my home in Sunderland with my husband and three sons.